I was going stir-crazy. My husband was down on campus administering an exam and wouldn't be back for hours. There was nothing to watch, nothing to recap, and I wasn't inspired to work ahead on my other deadlines. "Bake some cookies," my pastried friend counseled. I thought about it. I could bake cookies. I mean, it was Christmas time, my mother had sent me a packet of new cookie cutters, and I had just stocked up on decorating paraphernalia. Also? I had never attempted my mother's storied Christmas sugar cookies on my own. It's a simple recipe. It has six only ingredients. The steps are pretty much: make dough, roll dough, cut out dough, decorate dough, bake dough. However, leave it to me to make baking difficult. At first I tried to get out of it. "I don't have any butter," I whined to my pastried friend. "Don't you have that convenience store right up the block?" "Yeah, but their milk and cream is always expiring." "You aren't buying milk or cream. What about eggs? Do you have eggs and oil? You could bake muffins." "I don't have any eggs," I moaned. Finally, my poor pastried friend got me off the phone. I paced around the apartment a bit. I read the recipe. I shoved Poppadum in the bathroom with the shower running hot water and paced some more. I let Poppadum out. (It's not cat abuse. She's got a cold. She needs the moist air.) I considered dinner but couldn't see anything in my mess of a fridge, not even daylight. I read the recipe again. I cleaned out my fridge, after which I completely lost my appetite for any dinner. Finally, I went to the store. I got eggs, butter, and after checking the pantry, sugar. I got home and banged half a pound of butter and a cup of sugar together in a bowl. Then I looked at it and thought about it. I called my mom. "What kind of butter do you use?" I asked. "For the sugar cookies, what kind of butter do you use?" "I think it's lightly salted." "Can't you go back and get salted?" "I already added the sugar to the bowl. Maybe I should use a bit of salt for flavor." And because I was trying to find more ways of putting off baking, I then treated my mother to lecture about how culinary school taught me to always use fresh butter and why. My mother made vague noises at the other end of the line. They're the same noises she makes whenever I go off on a broad culinary tangent. I'm pretty sure she had started playing solitaire on her computer. I reluctantly climbed off my culinary soapbox because, it doesn't change how Mom's recipe has always been made, does it smartypants? So, yet again I'm walking into a baking extravaganza that I fear may turn into a very large disaster. Okay, it won't be a LARGE disaster, but it will be annoying if the cookies aren't absolutely perfect. These are simple cookies, but they are memory cookies. They are family cookies, historic cookies, and they have to taste exactly right. Of course to taste exactly right, they need to be decorated with 20-year-old sugars and have red hots and dragees (and those weird multi-colored tiny ball things that don't seem to have a real name. You know, the ones that aren't jimmies or sprinkles because they aren't shaped liked bacteria rods?). Sadly, making these cookies will already be less than perfect because silver dragees aren't even sold in California any more. Some brouhaha about them being poisonous or something. That attempt didn't go so well. The cookies were too thick, they tasted too floury, and in general, they pissed me off. However, last year I bought a pastry frame -- just like my mom's -- and a ribbed sleeve for my rolling pin -- just like my mom's -- and I made the cookies, and they turned out? Just like my mom's. Let me rephrase that: they tasted just like Mom's, and I guess that's really the important part, but they didn't feel like my mom's. They didn't look like hers either. My fingertips retain muscle memory from the cookie decorating I did as a kid. My brain was thinking, "Okay, I'm decorating a Christmas tree. 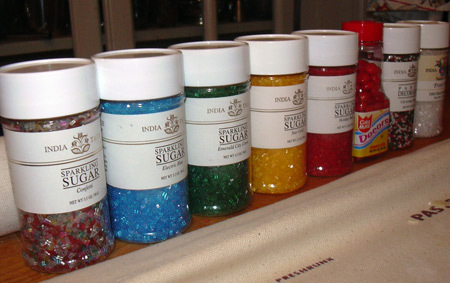 I need this big a pinch of green sugar" and my fingers pinched what they thought was required. Except, no. It was way too much green sugar for that tiny Christmas tree. Because why? Well, basically, if I want to keep passing the buck on my Christmas cookie failure, the real problem is not with me, it's with my cookie cutters. As I noted above, two years ago, my mom sent me a brand new, shiny set of cookie cutters. All the important Christmas cookie shapes are represented -- tree, candy cane, star, gingerbread person, etc. -- but they're not right. Mom's cookie cutters are the right ones. There's nothing obviously special about her cutters. Dating back to the early 70s, I doubt they were expensive or found in a high-end gourmet store. What makes them special and irreplaceable is that they are the ones that shaped every childhood Christmas cookie we made and ate. Years of my mother teaching our small buttered fingers to press down firmly, lift up quickly, and shake out the cookie have buffed the metal to a dull silver patina. Instead of being open on top and bottom they are open only on the bottom. The top is covered and there's a small handle in the middle -- the perfect size for little fingers to grip. And because mom's cutters are rounded, rather than sharp-edged like my new ones, the cut dough doesn't stick to the corners of the cutter. 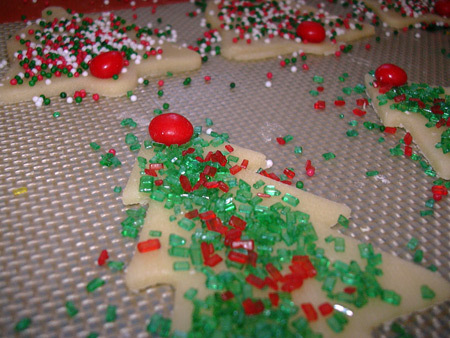 With my mom's cutters, all that's needed is to give the cutter a slight shake, or, if the cutter isn't floured well enough, a sharp a tap on the covered back, to plop the undecorated cookie softly on the cookie sheet. I find myself poking my fingers through the top of my cookie cutters to get the dough to drop off properly. Being the impatient sort, some of these poor cookies get jabbed so hard they develop indentations which I try to hide with decorations. This year, it's the bug's first Christmas, so I started a new Christmas cookie tradition and bought a new cookie cutter. Every year, I will buy just one new cutter in a new shape. When he's old enough, he can make his own selection; this year I got a snowman. They won't be my mom's cookie cutters, but for Bug, they will be his mom's.